Is there a better alternative to MoodBlast? Is MoodBlast really the best app in Chat category? Will MoodBlast work good on macOS 10.13.4? 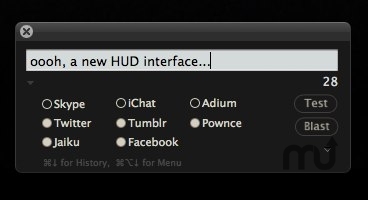 MoodBlast is a menubar/dock item (convertible) with a system-wide user-configurable hotkey that allows simultaneous posting of a "mood" to iChat, Skype, Adium, Twitter, Jaiku, Tumblr, Pownce and Facebook, or any combination of these services. Keywords preceded by "@", "!" or "%" allow for special functions such as current weather, current iTunes track, current Time (+x minutes) and other functions to be inserted. URLs are automatically shortened using Tinyurl. MoodBlast is a Leopard-only, native Mac application that can be navigated by keyboard commands alone, or used with a mouse and keyboard. Mac OS X 10.5 (Leopard) or later and at least one of: Adium, Skype, iChat, Twitter account, Jaiku account, Yappd Account, Facebook Account, Tumblr Account, Pownce Account. Growl is handy.